P2P group has released an updated version of “Virtual Audio Cable”. Description: Virtual Audio Cable software allows you to transfer audio (wave) streams between applications and/or devices. It creates a set of virtual audio devices named “Virtual Cables”, each of them consists of a pair of the waveform input/output devices. 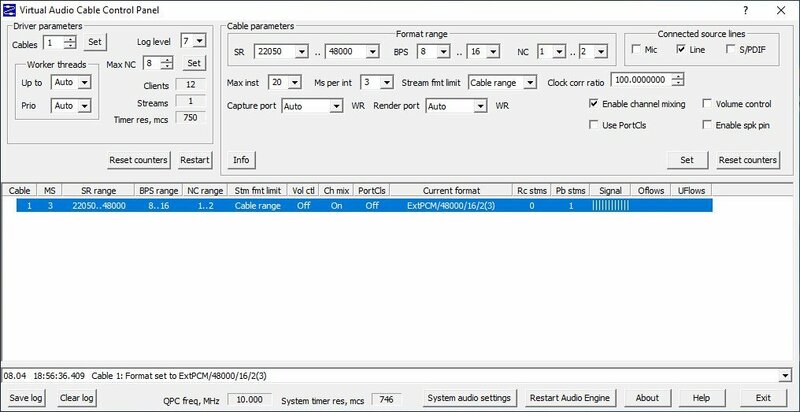 Any application can send audio stream to an output side of a cable, and any other application can receive this stream from an input side. All transfers are made digitally, providing NO sound quality loss (a bitperfect streaming). VAC behavior is similar to “What You Hear” (or “What U Hear”, “Stereo Mix”) feature of Sound Blaster Live! and Audigy cards. But it is only similar, not equivalent. If you simply need a function like “Stereo Mix” under Vista/Win7/Win8, there could be better to try to enable it in your audio adapter. VAC is useful to record application’s audio output in real time (audio player, instant messenger or software synthesizer), or transfer a sound stream to another application processing it. You can, for example, use two or more software audio players/generators/synthesizers/sequencers to produce audio streams, sending them to Virtual Cablet device and record a mixed stream from the same Virtual Cable device, using any recording software – Windows Sound Recorder, Audacity, Sound Forge, WaveLab, Adobe Audition (formerly Cool Edit Pro), Gold Wave, Cakewalk/Sonar, Cubase/Nuendo etc. You can use VAC to capture an output sound stream from the application that doesn’t allow to write it into WAV file directly. Unlike Total Recorder allowing you to simply save audio stream, VAC allows to route it in real time. VAC needs no hardware audio card; it is a “virtual audio card” itself.